A small modular reactor (SMR) system that uses a supercritical carbon dioxide (CO2) Brayton cycle instead of the steam Rankine cycle is under development at the Korea Advanced Institute of Science and Technology (KAIST). 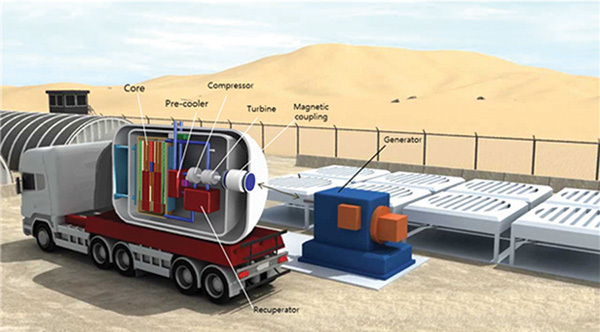 The 12-MW Micro-Modular Reactor (MMR) concept proposed by a research team led by professors Jeong Ik Lee, Yonghee Kim, and Yong Hoon Jeong could be transported by truck and is well suited to remote areas. It uniquely uses supercritical CO2 as a coolant as well as a working fluid, and it can run without refueling for 20 years and maintain decay heat removal by natural circulation. Additionally, it uses a next-generation printed circuit heat exchanger with no joints, welds, or points of failure, and is small and light because it adopts the semiconductor manufacturing process, the researchers said. The system (Figure 4) integrates the supercritical CO2 Brayton cycle to keep the reactor compact, the researchers said. Supercritical CO2 is an innovative power generation cycle whose turbomachines are smaller than those of the steam cycle or helium cycle, they noted. Meanwhile, a supercritical CO2 cycle achieves comparable efficiency with the helium Brayton cycle, but with a much lower turbine inlet temperature (550C versus 850C). Existing small modular reactor designs typically use water as coolant and oxidized uranium as fuel. “Although these may be good choices in making large reactors economical, there are economical limits when the capacity is reduced,” KAIST explained in a statement. That’s why it is focusing current research on developing a reactor design that uses uranium mono-nitride fuel and supercritical CO2 as coolant as well as the working fluid. Compared to uranium dioxide ceramic fuel and uranium-zirconium metallic fuel, enriched uranium nitride fuel has notable fuel performance properties such as high melting temperatures and high thermal conductivity. Significantly, it can improve safety margins, offer more flexibility, and provide better fuel cycle economics.